Brisbane Convention & Exhibition Centre (BCEC) turned in a winning performance at the 2017 Queensland Meetings & Events Australia (MEA) Industry Awards last night taking home three of the major venue awards. Celebrating industry leadership and professionalism, these awards come at a time when BCEC has been acknowledged as ‘The World’s Best Convention Centre’ by the international peak industry body, the International Association of Congress Centres. 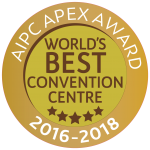 BCEC General Manager, Bob O’Keeffe said this latest achievement reflects the Centre’s continuing commitment to excellence in the meetings industry. “The MEA Awards provide the benchmark for professionalism and best practice in the Australian meetings industry and we are privileged to be a part of these awards. Brisbane Convention & Exhibition Centre will represent Queensland in its three winning State categories at the MEA National Awards to be held in Adelaide May.